This is an original design but is reminiscent of what might have been made a century or two ago. It works well in a solid color or multiple colors. The example is made in worsted weight acrylic yarn, but because of the adjustable sizing, this shawl works well in any weight of yarn. Use a hook appropriate to the weight of yarn used. Size: This shawl can be made any size. Five sizes are shown in this chart to help estimate yarn needs. There is a chart of the first 11 rows available. Make all stitches in both loops. Chain 4, sl st join in first ch to form ring. Row 1: Ch 3, 2 dc in ring, ch 1, 5 dc in ring, ch 1, 3 dc in ring. Row 2: Ch 3, turn. 2 dc in second dc, 2 dc in next dc, ch 1, (2 dc in next dc) twice, dc in next dc, (2 dc in next dc) twice, ch 1, (2 dc in next dc) twice, dc in top turning ch. Row 3: Ch 1, turn. Sc in first dc and in each of the next 4 dc, sc in ch 1 sp, sc in each of the next 9 dc, sc in ch 1 sp, sc in last 4 dc, sc in top of turning ch. Row 4: Ch 3, turn. 2 dc in second sc, 2 dc in next sc, dc in each of next 2 sc, sc in next sc, dc in next 2 sc, (2 dc in next sc) twice, dc in next sc, (2 dc in next sc) twice, dc in next 2 sc, sc in next sc, dc in next 2 sc, (2 dc in next sc) twice, dc in next sc. Row 5: Ch 3, turn. 2 dc in second dc, 2 dc in next dc, dc in each of the next 4 dc, ch 1, dc in each of next 4 dc, 2 dc in each of next 2 dc, dc in next dc, 2 dc in each of next 2 dc, dc in each of next 4 dc, ch 1, dc in each of next 4 dc, 2 dc in each of next 2 dc, dc in top of turning ch. Row 6: Ch 1, turn. Sc in first dc, sc in next dc, skip 3 dc, (dc, ch 2, 2 dc, ch 2, dc) in next dc, skip 3 dc, sc in ch-1 sp, skip 3 dc, (dc, ch 2, 2 dc, ch 2, dc) in next dc, skip 3 dc, sc in each of the next 3 dc, skip 3 dc, (dc, ch 2, 2 dc, ch 2, dc) in next dc, skip 3 dc, sc in ch-1 sp, skip 3 dc, (dc, ch 2, 2 dc, ch 2, dc) in next dc, skip 3 dc, sc in next dc, sc in top of turning ch. Row 7: Ch 3, turn. 2 dc in first sc, sc in next sc, (4 dc in ch sp, 4 dc in next ch sp, sc in next sc) twice, 5 dc in next sc, sc in next sc, (4 dc in ch sp, 4 dc in next ch sp, sc in next sc) twice, 3 dc in last sc. Row 8: Ch 3, turn. 2 dc in second dc, 2 dc in next dc, ch 4, skip (sc, 3 dc), sc in next two dc, ch 7, skip (3 dc, sc, 3 dc), sc in next two dc, ch 4, skip (3 dc, sc), (2 dc in next dc) twice, dc in next dc, (2 dc in next dc) twice, ch 4, skip (sc, 3 dc), sc in next two dc, ch 7, skip (3 dc, sc, 3 dc), sc in next two dc, ch 4, skip (3 dc, sc), (2 dc in next dc) twice, dc in top turning ch. Row 9: Ch 1, sc in first dc and in each of the next 4 dc, sc in ch 4 sp, (dc, ch 2, dc) in each of the next two sc, sc in ch 7 sp, (dc, ch 2, dc) in each of the next two sc, sc in ch 4 sp, sc in each of the next 9 dc, sc in ch 4 sp, (dc, ch 2, dc) in each of the next two sc, sc in ch 7 sp, (dc, ch 2, dc) in each of the next two sc, sc in ch 4 sp, sc in last 4 dc, sc in top of turning ch. Row 10: Ch 3, 2 dc in second sc, 2 dc in next sc, dc in each of next 2 sc, sc in next sc, (4 dc in ch sp, 4 dc in next ch sp, sc in next sc) twice, dc in next 2 sc, (2 dc in next sc) twice, dc in next sc, (2 dc in next sc) twice, dc in next 2 sc, sc in next sc, (4 dc in ch sp, 4 dc in next ch sp, sc in next sc) twice, dc in next 2 sc, (2 dc in next sc) twice, dc in next sc. Row 11: Ch 3, 2 dc in second dc, 2 dc in next dc, dc in each of next 4 dc, ch 4, skip (sc, 3 dc), sc in next two dc, ch 7, skip (3 dc, sc, 3 dc), sc in next two dc, ch 4, skip (3 dc, sc), dc in each of next 4 dc, (2 dc in next dc) twice, dc in next dc, (2 dc in next dc) twice, dc in each of next 4 dc, ch 4, skip (sc, 3 dc), sc in next two dc, ch 7, skip (3 dc, sc, 3 dc), sc in next two dc, ch 4, skip (3 dc, sc), dc in each of next 4 dc, (2 dc in next dc) twice, dc in top turning ch. Row 12: Ch 1, turn. Sc in first dc, sc in next dc, skip 3 dc, (dc, ch 2, 2 dc, ch 2, dc) in next dc, skip 3 dc, sc in ch 4 sp, (dc, ch 2, dc) in each of the next two sc, sc in ch 7 sp, (dc, ch 2, dc) in each of the next two sc, sc in ch 4 sp, skip 3 dc, (dc, ch 2, 2 dc, ch 2, dc) in next dc, skip 3 dc, sc in each of the next 3 dc, skip 3 dc, (dc, ch 2, 2 dc, ch 2, dc) in next dc, skip 3 dc, sc in ch 4 sp, (dc, ch 2, dc) in each of the next two sc, sc in ch 7 sp, (dc, ch 2, dc) in each of the next two sc, sc in ch 4 sp, skip 3 dc, (dc, ch 2, 2 dc, ch 2, dc) in next dc, skip 3 dc, sc in next dc, sc in top of turning ch. Repeat rows 13 through 18 until shawl is desired size. Refer to this chart for the number of repeats of certain instructions in the rows (given as X times and Y times). Row 13: Ch 3, turn. 2 dc in first sc, sc in next sc, (4 dc in ch sp, 4 dc in next ch sp, sc in next sc) Y times, 5 dc in next sc, sc in next sc, (4 dc in ch sp, 4 dc in next ch sp, sc in next sc) Y times, 3 dc in last sc. Row 14: Ch 3, turn. 2 dc in second dc, 2 dc in next dc, ch 4, skip (sc, 3 dc), sc in next two dc, [ch 7, skip (3 dc, sc, 3 dc), sc in next two dc] X times, ch 4, skip (3 dc, sc), (2 dc in next dc) twice, dc in next dc, (2 dc in next dc) twice, ch 4, skip (sc, 3 dc), sc in next two dc, [ch 7, skip (3 dc, sc, 3 dc), sc in next two dc] X times, ch 4, skip (3 dc, sc), (2 dc in next dc) twice, dc in top turning ch. Row 15: Ch 1, sc in first dc and in each of the next 4 dc, sc in ch 4 sp, (dc, ch 2, dc) in each of the next two sc, [sc in ch 7 sp, (dc, ch 2, dc) in each of the next two sc] X times, sc in ch 4 sp, sc in each of the next 9 dc, sc in ch 4 sp, (dc, ch 2, dc) in each of the next two sc, [sc in ch 7 sp, (dc, ch 2, dc) in each of the next two sc] X times, sc in ch 4 sp, sc in last 4 dc, sc in top of turning ch. Row 16: Ch 3, 2 dc in second sc, 2 dc in next sc, dc in each of next 2 sc, sc in next sc, (4 dc in ch sp, 4 dc in next ch sp, sc in next sc) Y times, dc in next 2 sc, (2 dc in next sc) twice, dc in next sc, (2 dc in next sc) twice, dc in next 2 sc, sc in next sc, (4 dc in ch sp, 4 dc in next ch sp, sc in next sc) Y times, dc in next 2 sc, (2 dc in next sc) twice, dc in next sc. Row 17: Ch 3, 2 dc in second dc, 2 dc in next dc, dc in each of next 4 dc, ch 4, skip (sc, 3 dc), sc in next two dc, [ch 7, skip (3 dc, sc, 3 dc), sc in next two dc] X times, ch 4, skip (3 dc, sc), dc in each of next 4 dc, (2 dc in next dc) twice, dc in next dc, (2 dc in next dc) twice, dc in each of next 4 dc, ch 4, skip (sc, 3 dc), sc in next two dc, [ch 7, skip (3 dc, sc, 3 dc), sc in next two dc] X times, ch 4, skip (3 dc, sc), dc in each of next 4 dc, (2 dc in next dc) twice, dc in top turning ch. Row 18: Ch 1, turn. Sc in first dc, sc in next dc, skip 3 dc, (dc, ch 2, 2 dc, ch 2, dc) in next dc, skip 3 dc, sc in ch 4 sp, (dc, ch 2, dc) in each of the next two sc, [sc in ch 7 sp, (dc, ch 2, dc) in each of the next two sc] X times, sc in ch 4 sp, skip 3 dc, (dc, ch 2, 2 dc, ch 2, dc) in next dc, skip 3 dc, sc in each of the next 3 dc, skip 3 dc, (dc, ch 2, 2 dc, ch 2, dc) in next dc, skip 3 dc, sc in ch 4 sp, (dc, ch 2, dc) in each of the next two sc, [sc in ch 7 sp, (dc, ch 2, dc) in each of the next two sc] X times, sc in ch 4 sp, skip 3 dc, (dc, ch 2, 2 dc, ch 2, dc) in next dc, skip 3 dc, sc in next dc, sc in top of turning ch. End with a row 16. Finish off and weave in end. The shawl can be made in a solid color or can be made with any number of color changes. The best way to make a color change is to finish all but the very last pull through of the two loops of the last stitch of a row. Cut yarn with a few inches of tail and join with new color next to stitch. Pull new color through last two loops. Weave in ends. 1/22/14 – pattern had said end with a row 17 but changed to say 16. Restrictions on the use of this pattern are available at http://stitcheryprojects.com/using-my-patterns/. Thanks for another great pattern. I am halfway through and love the results so far. The directions are very clear and easy to follow. This pattern looks so easy & pretty. Really anxious to start it. Directions seem simple to follow. Thanks for sharing. I absolutely love your work!! I have the Fans and Pansies Shawl on my next to do list!! You explain your patterns so well, I never have a problem. Thanks so much. Elaine. If this was worked twice and joined along starting rows would it form a rug (is each piece a triangle). This one is not quite a triangle. The arms slope down slightly from the neck. My other shawl pattern on the site does make a true triangle. This is a beautiful pattern and would love to make this a birthday gift for my sister in law with her sorority colors (blue and white). Is this shawl worked from top to bottom? I want the white to be the same as it’s shown in the picture. Thanks! Yes. It begins at the neck and works down and across the arms. I am trying to work through this shawl and I am having a lot of problems with the pattern. I am starting row 8 and my pattern does not look anything like the finished product. I find the pattern difficult to follow. Do you prefer charts or think a chart would be helpful? If you like you can send me a picture if you want my help figuring it out. Here is a chart of the first 11 rows. I hope this helps. Your Fans and Pansies Shawl is done so Beautiful. I’m going to try it. I do not understand the X times and the Y times. Please explain. Thank you. As rows 13 to 18 are repeated, each time they will have more pansies going across the row. Instead of writing these 6 rows over and over and over so that the pattern was pages long, I made a chart with the number of times things were being repeated in each set of 6 rows as the shawl grows. For rows 13-18, when it says Y times that is 4 times and when it says X times it means 3 times. On the next set of 6 rows, rows 19-24, when it says Y times that is 6 times and when it says X times it means 5 times. This pattern looks lovely! I just have one question. How do I make it in different sizes? I read through the pattern, but I did not catch how to make a larger or smaller size. It grows with rows. Just continue with the rows until it is the size you like. shawl’s for cancer patients and people God leads us to bless. This will be a great addition to our patterns. Thanks so much for sharing. Always in need of yarn for our projects. Wow, you are amazing to be able to write out such a complex pattern. I’m definitely going to try this one… So pretty! Thank you! I’m going to try this one – will donate to the prayer shawl ministry. As if this is the pattern I’ve looking for. We are also making shawl, poncho and cardigan for our own use and for sale. This will be an added pattern. Thank you so much and God bless. Greetings, The Fan and Pansies Shawl is so beautiful. I am a beginner and would like to make a scarf, rectangle style. 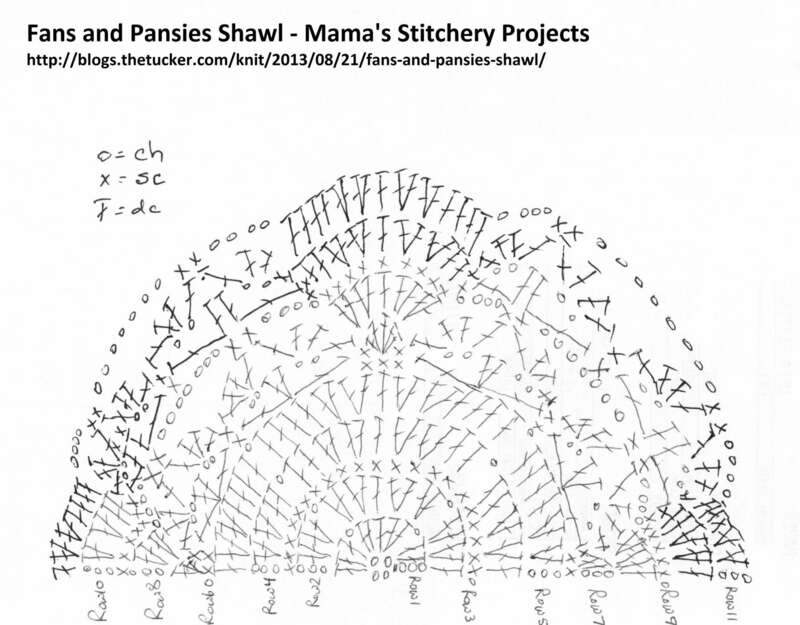 How would I do it with the Fan and Pansies stitches? The Fans make this ripple by their nature. If you want a rectangle, it will have to just be the pansies. I can help with that if you are interested. Greetings, Yes! I would Love To make a rectangular scarf/shawl as well and somehow figure out how to add the lovely trim! I somehow, lost your website and came across it last night on “All Free Crochet!” I am learning how to read pattern charts and if there is a pattern chart for the triangle shawl above, that would be exiting to work with! I’m so visual! Thank you ever so much! So Happy I found you again! please send me pattern starting row 13 on … for size medium. .
this design is gift friendly for any season. thanks. I’m sorry I’m just now getting back to you on this. I want to understand exactly what you are needing. Are you wanting to know how many rows to make for a medium? Do you want the pattern written out row for row instead of having the chart with the number of repeats? My confusion is that if I end on row 17, that is a straight edge not a scalloped edge like the one shown in the photo? You are correct. I had said the wrong row. Thanks for letting me know. I’ve modified the pattern. Love the look of this pattern. Looking forward to creating one of my own! Thanks!! I love this better than the original wrap pattern I showed you! This is beautiful! I missed your “Fans & Pansies Shawl” Would you please send it to me. We are also crocheting for cancer victims so would like a variety of different patterns. Thanks for your help. Thank you for sharing. May I share a prayer with you? I’m almost finished with this fan and pansies shawl…It’s turned out beautiful! I do have one question. Would you recommend an edging for the top around the neck. It looks unfinished. Maybe just a single crochet or picot edging. I’d love to know what you decide to do. I am confused about row 8. Help! I chained 4 and what do I skip. I’m still a bit between beginner and intermediate. On row 7 you made 4 dc in each of the ch spaces of each pansy. Between the two sets of 4 dc on each pansy there is a little gap. After you chain 4, sc in each dc on either side of that gap. I’m sorry for the confusion. Yes, when it says skip before () then it means to skip all those stitches. I am a fairly new crocheter, and I was doing okay until I got to Row 13 and 14. In row 13, you are doing 4 dc for most of row. Row 14, keeps saying to skip 3 dc, and 1 sc, and pretty much continues with that. If the row before has 4 dc how can the next row look for 3dc and 1sc ? I am probably just dense. I love the looks of this shawl. On row 13 you were making a sc on either side of the pansies and making two sets of 4 dc in the pansies. For row 14 you will be making the lengths of ch specified (4 or 7) and making sc in each of the two topmost dc of each pansy. That is where the skipping of the 3dc and 1 sc comes in. Before making those stitches you will be skipping the sc before the pansy and the first 3 dc and after making those two stitches you will be skipping the last 3 dc and the sc. Any plans for a short cape? My grandmother had one that started with short band at neck with tie. Shaped over shoulders and extended down over elbows almost to waist when seated. Did not get in way like a triangle does. Her’s was knitted, but I only crochet. Have looked for years to duplicate. No luck. Update on my shawl. I am on row 21, so it looks like I have finally got it. Thanks. The turning chain is the few chains that are made at the beginning of each row. It is called the turning chain because they are made and then the work is turned to make the next row. To make a stitch in the “top of the turning ch” is to make a stitch in the chain that was the last made before the next stitch, so for a ch 3 would be the 3rd ch. I am having great difficulty with row 10. Is it correct? I read through it again and everything looks correct. Is there a specific part that isn’t working? I’m so sorry I’m just now getting back to you on this. Once you get idea of how this is made, you probably won’t need the chart. It is really just to verify that you are on track. You can just repeat directions while you are in the “pansy area” and follow the other directions when you are in the “fan area”. I am having a hard time with Row 16 (4dc in chain space, 4dc in next chain space, sc in next single sc). The chain spaces seem to have already been used up in Row 15, I can’t find any chain spaces to use for 16. I am sure I am confused. Help? I am so sorry I am just now getting back to you on this. The chain spaces that these 4 dc are worked in were formed on row 15 as – (dc, ch 2, dc) in each of the next two sc. Help!! I want to “learn” to read these patterns. Is there any website that could help me? well written pattern and I will try to make. Can I post it on Face Book Page? As a link, absolutely. I just asked that my patterns aren’t reproduced other places, but links are great. I love this shawl and it will be the second one I make. I’m a little confused about when I space a stitch. I’m still a little new to crocheting. Making a stitch in a chain space, or something else about stitch spacing? Do I skip a stitch for the space? Spaces can be formed by skipping stitches, or they can just be formed by adding chains between stitches. Do you have a tutorial for the first 3 rows? I don’t have a video because I don’t have a good video arrangement currently. There is a chart of the first several rows. If you describe your specific questions I may also be able help. Hi, Im having trouble with row 8. I have gone back and redid row 7 in case that was the problem and pulled out all of row eight 4 times and still at the end of the row I have 5-6 more stitches left. When you skip and then go to make your next stitch, should I be usisg the next stitch if its not a previous double crochet or just start the next stitch even if the next stitch is a chain space? Dont know what Im doing wrong. !How can I get the chart for the first 11 rows? Thanks very much! Oops – got it! Thanks anyway & Happy New Year!!! Would you send me a copy of the pattern written row by row? If you can’t I understand. It is a beautiful shawl. I’m just not getting the chart. Thank you for sharing your talent. I sent it in an email. Would this be small enough for a 7 year old? One nice thing about this pattern is that the shawl just gets bigger as you add rows. So you can actually decide as you make it if it has gotten to the size you think would work best. This is one of the hardest pattern I have ever found…no idea what I’m doing wrong…..the chart was so messy from 7 on it was impossible to read. I have been crocheting for over 50 years. I’m sorry about my messy chart. Most of my patterns aren’t straight rows, so I have to hand draw them. Could you send me a picture of what you have so far and maybe I could see the problem? This shawl is so elegant. I work in an office that gets a little chilly because there are so many people, they have to run the A/C at times. This will be perfect for me. Thank you for sharing your work. Thanks for the pattern. PDF version missing row 5. The PDF is generated on the fly. The app that generates it deletes any sections that you click on. This is a feature available so that you don’t have to print anything you don’t want to, but sometimes it’s easy to accidentally click something by mistake. This pattern says it is easy, but I am having a difficult time understanding this pattern. I am a beginner and I keep getting stuck. I tried to follow the chart but that is not clear either. I am giving up on this pattern. That is another site that rated this pattern as easy. I wouldn’t called it a beginner pattern. I’m sorry it was frustrating. I came back to try this pattern again because I love it.I had taken another crochet class and learned how to read charts. I was able to make this shawl after looking at the chart and following the written instructions. It really was not bad at all and I am happy with the result. My shawl turned out beautiful. Thank you so much for sharing your beautiful pattern. I’ve started it and it is coming together beautifully. In row 7 for the “pansies”, you made two sets of 4 dc in the chain spaces. For row 8 for the pansies you will be making chains of 4 between “fans” and the pansies nearest the fans and making 7 chains between pansies. On the pansies you will make sc in each of the two center dc. So after the fan you will chain 4. After the fan there is sc from row 7 that was made right beside the fan onto the chain of row 6. Then there are 3 dc of the pansy before the 4th and 5th dc which are the center ones that you will sc in. So those are the sc and the 3 dc that you skip before making the two sc stitches. Thanks so much for this awesome pattern and for your patience with your fans. I am a cancer survivor and on the road to recovery, and back to crocheting after many years away from the craft. Chemo caused eye damage so I find it hard to read patterns in books. I can enlarge the screen & read online patterns just fine. I am anxious to get started on this shawl…but just wanted to let you know how much it means that you take the time to help us. I really live your pattern. It is simply beautiful. However, am having trouble with understanding the meaning of (2 dc in next dc) twice. Dies this means there are 4 dc in that same dc? It means 2 dc in the next dc then move to the next dc and do 2 dc. I did a chart for the next three rows. I just built it on a section of the first chart, so only did half of the rows. Hopefully you can follow what I did. Let me now if it doesn’t make sense. Help me to understand in the 3rd row: what does (2 dc in next dc) twice, dc in next dc,mean? does it mean 4dc in same stitch? The key there is “next” which always means to move to the next stitch. You you will make 2 dc in the next dc and then move to the next dc to make 2 dc. Then you will move to the next dc to make a dc. I love your patterns. The way you list the next size and the amount of yarn needed for each size and the expected measurements. I have been crocheting for approx. 25 yrs. and your patterns give the most information. I can’t wait to try this pattern. I haven’t been able to make videos in a while, so haven’t made one for this one, but it’s on my to-do list. I am stuck on 10th row I just don’t get where to do 4 dc and totally how many times it will come. 2 times or 4 times? These 4 dc are made in the “pansy” portion of the row, not the “fan” part. In the prior row you established the pansies by making two (1 dc, ch 2, 1 dc) beside each other. You will make 4 dc in each of these ch-2 spaces, so each pansy will have two sets of 4 dc. Oh, how I’d love to make this shawl! Unfortunately, the dark brown background on the pattern covers up the first inch or so of each line, so I can’t read it. Is there anyplace on line where I can get the pattern without the fancy background? Of course, when I finally find the pattern I’ve been looking for, it’s not readable on my computer. Oh, well! Waiting for a hero to tell me how to get the pattern. The printer icon at the top will create a copy without a background and comments. You can then print it or make a pdf file. Can you send me instructions for row by row . I can’t understand the chart. I did fine until row 13. Please and thank you. Thank you so much for emailing me the instructions. The shawl turned out beautiful ~ loved this pattern. I make shawls for my friend who makes and distributes comfort baskets to women and men going through the cancer treatment. I can’t wait to give her this one. Thanks again for helping me. There seems to be a discrepancy between written directions and chart for the 4th row. Written says sc in next sc and chart indicates a ch1 for that stitch. Also I think it would be helpful in the written directions could end with # of stitches on each row so the pattern would be correct. Good catch. I had not noticed that before. It actually works either way. My sample has a sc. I think the beginning of my chart was from when I was planning it and I changed my mind on the stitch in the making of it and when writing it. I do add stitch counts to some of my patterns but didn’t on this one since there is such a mix of stitch types. where is the pattern for the edging? It’s all made in the same pattern. I just changed colors for the last few rows. Thank you for this beautiful pattern. I am fairly new at this and the pattern is complicated. I am sure after doing the repeat several times it will become easier, at various points, it would be easier. I think if you included hints, like where I should be. Even telling in the pattern where the middle is. Of course a video would be perfect but I know that takes time to do. I have been following Esther on It’s all in a nutshell so I have learned an amazing amount in a short period of time, but I have a lot to learn. I would appreciate any hints you do have. Thank you. I’m sorry I’m just now getting back to you on this. How is it going now? I think after a couple of sets of pansies that you will get used to the pattern and it will become easy. HELLO, I JUST FOUND THIS PATTERN ,WANTING TO MAKE SOMETHING FOR MY DAUGHTER..SHE JUST BECAME A DEACONESS AT HER CHURCH..YES I GOT STARTED AND CAN NOT STOP! IT IS IN WHITE AND LOOKS SO NICE. NO TROUBLE AT ALL..NEED TO BE MINDFUL OF WHAT YOU ARE DOING. THANK YOU AND HOPEFULLY I CAN MAKE MORE OF YOUR GREAT PATTERNS.. BE BLESSED. I seem to be stuck on row 6, as I’m a beginner with crochet. Could you also send me written instructions for each row. I love how this is working up and have a friend who wants one also. Thanks so very much for sharing this! I will send you the written out rows for 13 forward, but that won’t help with row 6. What has you stuck on row 6? If you can, send me a picture at mama at thetucker dot com and I will see if I can figure out what is going wrong. I am stuck on row 14.Row 14: Ch 3, turn. 2 dc in second dc, 2 dc in next dc, ch 4, skip (sc, 3 dc), sc in next two dc, [ch 7, skip (3 dc, sc, 3 dc), *sc in next two dc] X times, ch 4, skip (3 dc, sc), (2 dc in next dc) twice, dc in next dc, (2 dc in next dc) twice, ch 4, skip *(sc, 3 dc), sc in next two dc, [ch 7, skip (3 dc, sc, 3 dc), sc in next two dc] X times, ch 4, skip (3 dc, sc), (2 dc in next dc) twice, dc in top turning ch. After ch 4 I do not have a sc and 3 dc to skip. Let’s look at Row 13 backwards to see the groundwork for Row 14. Row 13 ends with 3 dc. Before that if we look at the section that is repeated 4 times backwards it is (sc, 4 dc, 4 dc) four times. So Row 14 will be working across the backwards Row 13. The “2 dc in second dc, 2 dc in next dc” are the second and third dc of the 3 dc at the end of Row 13. Then “ch 4, skip (sc, 3 dc)”. The skipped stitches are the sc and the first 3 stitches of the 4 dc that were made in the the ch sp. Then the “sc in next two dc” will be a sc in the last of the first 4 dc and then a sc in the first of the next 4 dc. Does that help? I seem to keep coming up with an extra SC at the end of row 16. Is this normal? It should go to the last sc. End of Row 16: 4 dc in next ch sp, sc in next sc (1 sc), dc in next 2 sc (2 sc), (2 dc in next sc) twice (2 sc), dc in next sc (1 sc). So this uses 6 sc after that last ch sp. These are being made in to the beginning stitches of row 15 in reverse order. So if I reverse the beginning of row 15 (Ch 1, sc in first dc and in each of the next 4 dc, sc in ch 4 sp, (dc, ch 2, dc) in each of the next two sc) I have: dc, ch 2 (ch sp), dc, sc in ch 4 sp (1 sc), sc in each of 4 dc (4 sc), sc in first dc (1 sc). There is the ch sp followed by 6 sc. Can you please tell me what size would work for a little girl, size 5 or 6? I would love to make for jy daughter. It will be my first clothing piece. For this particular shawl style I’d measure from neck to wrist and make the shawl that length from collar edge to the center panel edge. I think it would. What’s nice about shawls is they are much more flexible on size than something more fitted. I’m sorry about the quality of the chart. I have to make my charts by hand because I’ve not found a software that will make crochet charts for items that are rippled or circular. I just want to say that this pattern is amazing! You are so kind and generous to share what is a very complex pattern for free. There are patterns that are very simple that ppl are charging a ridiculous amt of money for so I want to thank you from the bottom of my heart for your generosity. It must have taken you an enormous about of time to design this and write it all. Also the pattern looked as tho it would be complicated but it isn’t at all. I thought esp the chart with x’s and y’s would be complicated but, again, it wasn’t. I’m about 3/4 done. I’ve done the 13-18 sequence twice and since it’s for a 10 year old don’t have much to go and it’s working really, really well. I used the written version..not the chart. I’ve never followed a chart in my 50 years of crocheting and this pattern is so clear and easy to follow. Thank you again and I would just like to hug you so here is a cyber hug. After the last row 16 of the shawl, mark center front point on each side with safety pin. Ch 1, sc around dc posts and in row ends. When you reach safety pin, make a ch long enough to tie (30 sts for the doll size), and sl st in the back hump of each chain to get back to the edge. Continue sc around neckline to the other center front pin and make another tie. Continue to corner. Ch 1, turn and reverse sc back, working around ties. Finish off. I learned the reverse sc technique to finish an edge in an afghan pattern I made. It can be found on you-tube also. Simply described , you work from left to right and sc in the st before the last st made. Makes a knob-like thing that finishes your edge. I love this! I would like to post an entry with your adjustments and pictures if you wouldn’t mind. I know so many others would really appreciate this version. One correction, don’t turn before beginning the reverse single crochet finishing row. Feel free to post my pictures and instructions. This looks like a beautiful shawl and I want to try it but is seems confusing written the way it is. Is there a pattern for it written ” row by row ” ? I am not new to crocheting but just dont understand the instructions. Thank you ! I’m emailing you the written out rows after row 12. The inside edge is smooth enough that you could add an edging to it. You could incorporate ties or some other kind of latches. Do you think that would make them easier for them to use? What a wonderful pattern, I’m ready to start my second shawl and just love the results. Easy to follow pattern. I’m making for our Prayer Shawl ministry at our church. We are making some for our local nursing home and this will be perfect for someone in a wheel chair. Thank you so much for the pattern. 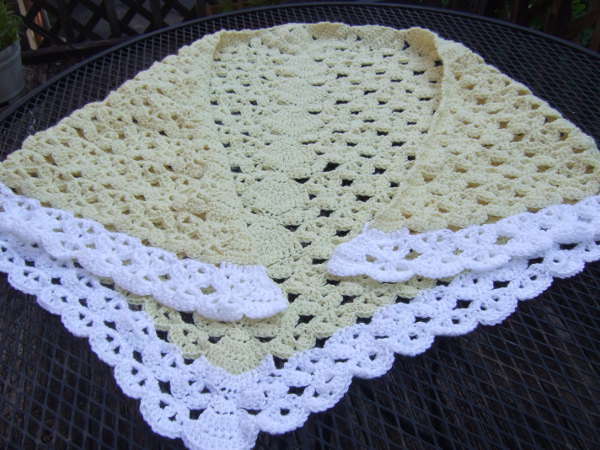 would you have a shawl pattern like the crochet one only in knit as that is just what I was looking for to knit some for the seniors home’ Your patterns are beautiful and so easy to knit. Love the pattern! Thank you for sharing it. I like that idea a lot. I added color rows to the chart and also found an error or two extra sc I removed. God bless your giving heart. What a way to spread the beauty!